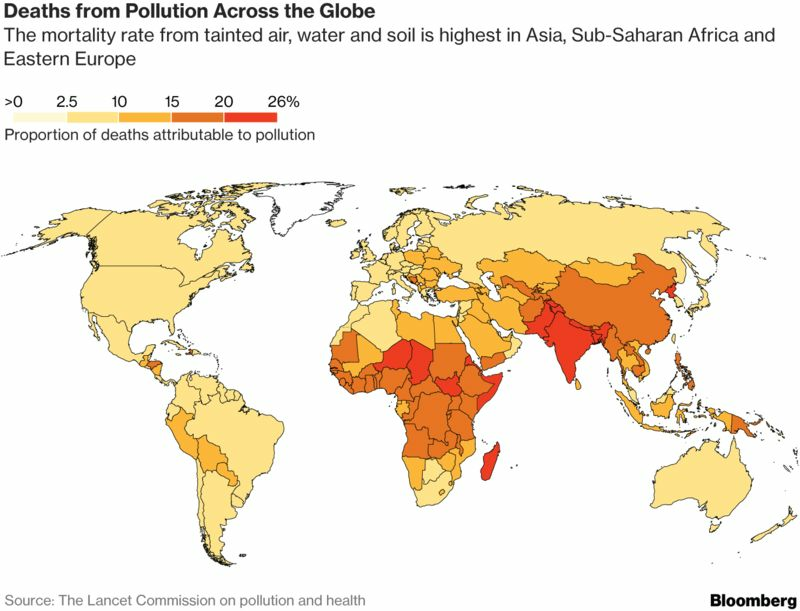 Pollution in all its forms killed 9 million people in 2015 and, by one measure, led to economic damage of $4.6 trillion, according to a new estimate by researchers who hope to put the health costs of toxic air, water and soil higher on the global agenda. And that was just in 2015, according to a new global report on the consequences of humanity’s actions. In less-developed nations, pollution-linked illness and death drag down productivity, reducing economic output by 1 percent to 2 percent annually, according to the tally by the Lancet Commission on Pollution and Health, published Thursday by the U.K. medical journal. The report is intended to illuminate the hidden health and economic consequences of harmful substances introduced into the environment by human activity. Diseases caused by pollution account for about one in six deaths worldwide. 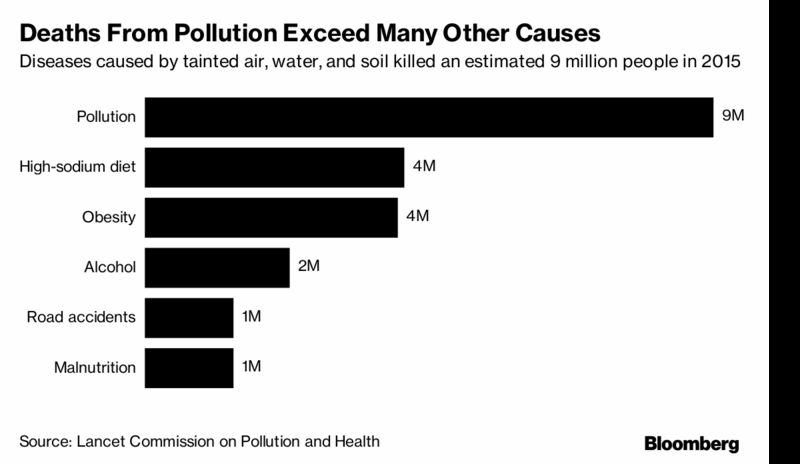 “I was shocked, when we started running the numbers, to see what a substantial impact it had on health,” said Richard Fuller, co-chairman of the commission and founder of Pure Earth, a nonprofit that cleans up toxic sites in developing countries. Fuller said the report was inspired by conversations he had with finance ministers who wanted evidence that pollution was a real problem. The report represents an “extremely comprehensive and rigorous quantification” of pollution costs, said Francesca Dominici, a professor of biostatistics at the Harvard T.H. Chan School of Public Health, who wasn’t involved in the study. 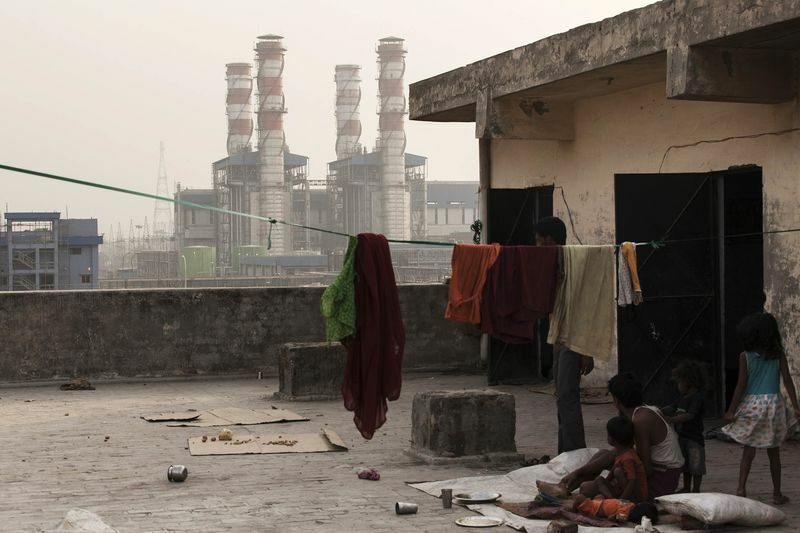 Chimneys at a power station loom over Delhi. While the scientific and public health consensus on the harms of pollution may be clear, reducing it means confronting “powerful vested interests” that often hold sway over governments, sow doubt about science and “paralyze governmental efforts to establish standards, impose pollution taxes, and enforce laws and regulations,” the Lancet commission’s report notes. The study aims to bolster the political will to take on such fights. That’s already happening in some places: Chinese President Xi Jinping mentioned the environment more than the economy in his speech this week to the National Congress of the Communist Party, a major gathering of party leaders that happens every five years. Almost 20 percent of deaths in China are attributable to pollution, according to the Lancet commission report. In India and Bangladesh, about a quarter of fatalities are tied to it. In the U.S., meanwhile, less than 6 percent of deaths are attributable to pollution. The most fatal type of pollution is airborne, causing about 6.5 million of 9 million annual deaths. That includes smog from power plants, factories and vehicles, as well as household emissions from dirty indoor stoves used in poorer countries. Contaminated water, soil and occupational exposures to dangerous chemicals contribute significantly to the death toll as well. “The costs of pollution-related disease are often overlooked and undercounted,” the report states. Conditions such as heart or lung disease or cancer can take years to manifest and are spread across broad populations. Meanwhile, the burden of pollution-related disease falls disproportionately on the world’s most vulnerable people—children and the poor. The authors argue that countries can separate pollution from economic growth, pointing to the U.S. as an example. Gross domestic product, adjusted for inflation, has increased by 250 percent since 1970, when President Richard Nixon signed the Clean Air Act. Over the same period, concentrations of such common air pollutants as lead, particulate matter and sulfur dioxide have dropped in the U.S. by 70 percent. Reducing environmental toxins can also yield economic benefits in ways that aren’t as apparent as more obvious health benefits. For example, burning leaded gas leaves the pollutant in the air. When children inhale lead-polluted air, they can suffer cognitive impairment. The levels of lead in children’s blood plummeted after regulators began phasing it out of fuel in the 1970s. By the late 1990s, the average IQ of preschoolers had risen by an estimated 2 points to 5 points, according to one analysis by the U.S. Centers for Disease Control. That improved cognitive power would lead to greater productivity over their lifetimes, accruing economic benefits calculated at more than $110 billion a year. But such improvements won’t happen on a global scale without a fundamental change to an economic system “in which natural resources and human capital are viewed as abundant and expendable, and the consequences of their reckless exploitation are given little heed,” the authors write. The Lancet Commission report took two approaches to valuing the costs of pollution. Looking strictly at productivity, the researchers calculated that deaths from pollution reduced gross domestic product by up to 2 percent in low-income countries, and in smaller degrees farther up the income scale. That measurement counts only the lost economic contributions of working-age people, so the cost of deaths of people over 65, for example, wouldn’t be included. An alternative approach attempts to quantify the “welfare loss,” essentially a way to put a value on lost life. By estimating how much people are willing to pay to reduce their risk of dying prematurely, economists can put a price tag on the costs of the pollution that increases that risk. In 2015, this number was $4.6 trillion, equivalent to about 6 percent of global economic output and close to the GDP of Japan, the world’s third-largest economy. As large as that figure is, it may even underestimate the full cost of pollution. Because the amount is derived from death rates, it doesn’t include the price of medical expenditures or lost productivity from those sickened but not killed by pollution-related disease. And it doesn’t measure some forms of pollution that are likely to have health effects, such as soil tainted with heavy metals or industrial toxins, because data to calculate its influence on health are insufficient. Would you recommend Pollution’s Annual Price Tag? $4.6 Trillion and 9 Million Dead to a friend? Your Review on Pollution’s Annual Price Tag? $4.6 Trillion and 9 Million Dead has been successfully submitted.